Sunday, September 25, 1859.Springfield, IL. Lincoln writes to fellow Republican Richard Yates, of Jacksonville, Illinois, and informs him that "There is a strong desire with some—and I rather think all—republicans here that you will allow them to run you for congress in this [6th] District this fall." 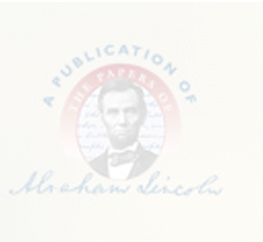 Lincoln reports that he and U.S. Senator Lyman Trumbull "anxiously desire" Yates's candidacy. Lincoln instructs Yates to respond with a decision to either James C. Conkling or Milton Hay, both of Springfield. Lincoln closes, "Do not say no." Abraham Lincoln to Richard Yates, 25 September 1859, IHi, Springfield, IL; CW, 11:17-18.